In one large bowl , pour the milk,mix sugar & cardamon in it. 2. Now add 3tsp ghee & whisk it.also mix the baking soda. 4. Now stop adding maida & make a soft dough of the prepared mixture. 5. Cover the mixture for an hour. 6. Now divide the dough in to 5 pieces. 7. Take 1 portion & further divide it in to 3 small pieces. 8. 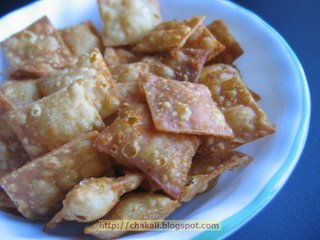 Make small puri of each piece & then place them on each other & then make again puri of it. 9. Make the shankar pale(in hindi it is called 'shakkar pare')of it & deep fry them in to ghee. 10. Repeat the same procedure for remaining dough. 11. This slight different recipe of shankar pale makes the shankar pale more soft.